Over the past seven years, Cape Town based communications agency MANGO-OMC has developed a national footprint in the converged communications space and a well-deserved reputation for conceptual thinking and effective implementation. With a strong, compact team we have created a business model that enables us to pull in external resources and skills as and when required at no additional (marked-up) cost to our clients. This extended team is made up of trusted suppliers that have become an integral part of MANGO-OMC. The model ensures flexibility and an ability to roll with the landscape. Known for our solution-oriented approach, energy, passion, creativity, attention to detail, tenacity, loyalty and desire to do our very best, we believe in outcome based reporting and measurement systems and work well to objectives and targets set in partnership with our clients. We design logos and corporate identities and implement them across the full range of print and online applications. Our print work ranges from business cards and letterheads through folders, brochures and posters to annual reports and packaging. Our online applications include both email and website design. We share offices with our online partner Signpost, ensuring close collaboration and seamless integration of our clients' online and offline identities. FUEL was founded in 1999 and we have produced great design for our clients, both in print and online, for more than a decade. Contact TLC Productions if you have any interest in the following aspects of music and theatre productions. 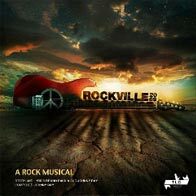 TLC Productions are the producers of Rockville 2069, a rock musical for a new era.